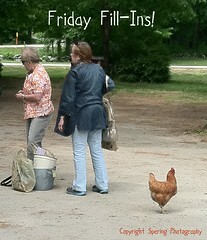 It has been a long while since the last time I participated the Friday Fill-Ins. I got addicted to Frontierville again and my already busy life became busier and put the blogging take for granted. Anyway, time to play this meme and start filling in this sentences. 1. I remember when I first heard my baby cried, it was a wonderful feeling. 2. It was raining and showering down this morning. 3. Most humans are sinners. 4. What do you think of the song, does it ...sound familiar? 5. I was inspired by my children. 6. Who cares who knows where! 7. And as for the weekend, tonight I'm looking forward to stay up a while to finish couple of task, tomorrow my plans include unpacking as usual and Sunday, I want to take a little break from unpacking and take the kids to the playground maybe!